Data and analytics are fundamentally reshaping all aspects of the travel industry, and brands that don’t adapt will be left behind in the data-led age. EyeforTravel set out to understand where the industry stands currently with regards to data and analytics, where it is struggling, and what the future might hold. 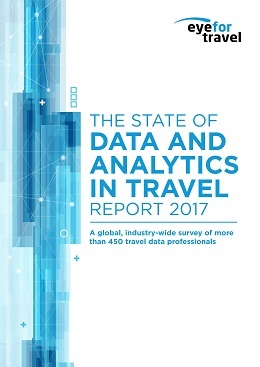 We did this through a global survey of more than 450 travel data professionals, encompassing all major verticals and job roles. How spending on data teams and capabilities is changing. What is driving analytics programs and what kinds of analytics are organizations using? What are the main data sources being used to create insight? What are the main challenges facing data professionals? The strategies the industry is deploying to lower costs and improve understanding. What does the industry believe is the best performing social media network? With this report you will be able to understand the big trends transforming the industry and be able to direct your data and analytics efforts more effectively. Or if you are already an EyeforTravel On Demand subscriber, then click here to go to our white papers and just log in. Let me know if you want any more information about the content, EyeforTravel’s proprietary data, or our events. How Is Data Changing Travel?